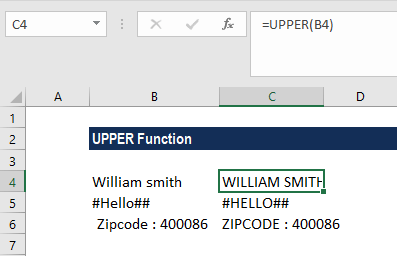 UPPER Function – How to convert text to all capital letters? 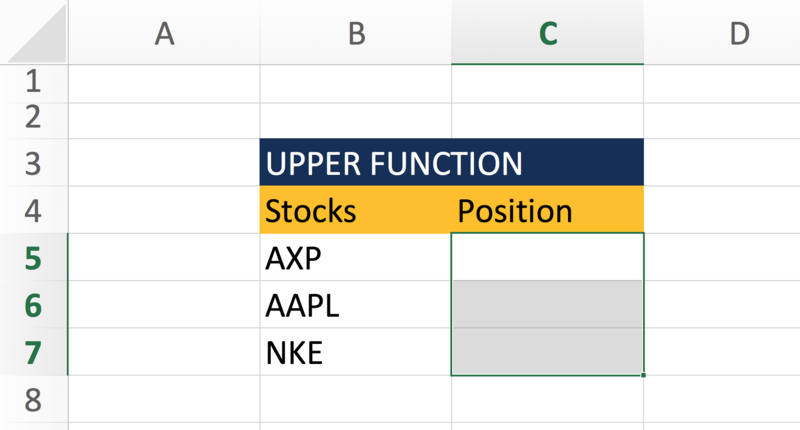 The UPPER function is a Text functionFunctionsList of the most important Excel functions for financial analysts. This cheat sheet covers 100s of functions that are critical to know as an Excel analyst, that will convert text to all capital letters (UPPERCASE). Thus, the function converts all characters in a supplied text string into upper case. In financial analysis, we often import data from external sources. The UPPER function will help us convert text to upper case if required. It will not affect numbers and punctuations. Cleaning up data for analysis is often a very time-consuming step, Text functions are often great tools to speed up the process. Text (required argument) – It is the text that we want to convert to uppercase. Text can be a text string or a reference to a cell. How to use the UPPER Function in Excel? As you can see only letters were affected on the string, numbers and symbols were left unchanged. Data Validation will then prevent users from entering strings that are not upper case text. The function above will check for two things, if the data entered on the selected cells are text AND if the data entered is in UPPER case. 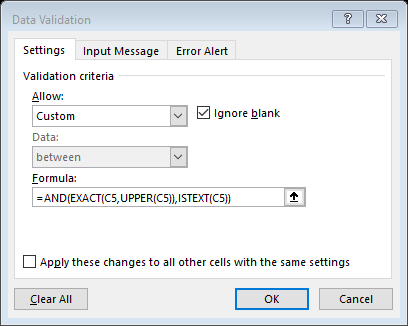 Data Validation is always checking the input of the cells, to ensure that only correct data is entered in those cells. All letters in text are converted to uppercase.